Before you unwind, hit the pause button and get off your behind! 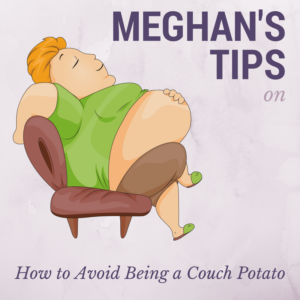 Prolean Wellness’nutritionist, Meghan Doherty, gives her five best tips on getting off the couch and on to an active lifestyle by usig what you’ve got! Tip #1: Use the 5 minute rule. Give yourself just 5 minutes to get up and off the couch to begin a workout regimen. If you are still not in the mood to get moving after 5 full minutes, give yourself a rest and try again tomorrow. However, try not to sit down for at least an hour before lying down for bed. Tip #5: Make time for yourself! Make a date with yourself (or with a loved one/friend) to go on a daily stroll outdoors. Whether it be first thing in the morning, on a break at work, or after dinner… walk around a school track, cruise through the mall before it opens, or stroll through your neighborhood. Take in the fresh air, fall smells, and maybe a good conversation or upbeat song, too. It will boost your mood and activity levels. Aim for 10,000 steps per day!